BALTIMORE, MD – Prominent philanthropist Eddie C. Brown, Chairman, CEO and Founder of Brown Capital Management and his wife C. Sylvia Brown were awarded Honorary Doctor of Humane Letters from The Johns Hopkins University in May for their philanthropic achievements. It is believed they are the first couple to be awarded joint honorary degrees from the institution. The honorary degrees from Johns Hopkins are just the most recent acknowledgement of the Brown’s civic and philanthropic efforts. In 2011, the Maryland Historical Society named the Browns as their “Marylanders of the Year,” an award whose past recipients have included Ben Bradlee, Tom Clancy and Sargent Shriver; and that same year the couple was honored by the Ron Brown Scholar Program. 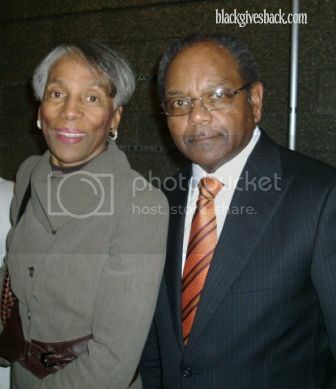 The Brown's charitable foundation (C. Sylvia and Eddie C. Brown Family Foundation) was established in 1996. Since then, the Foundation has granted millions of dollars in gifts to such Baltimore-based institutions as the Maryland Institute College of Art (MICA), the University of Maryland, Baltimore County (UMBC), the Turning the Corner Achievement Program (TCAP), the Enoch Pratt Free Library, Brown Scholars, Johns Hopkins Bloomberg School of Health, and the Reginald F. Lewis Museum of Maryland African American History & Culture. In 2002, the couple created the Brown Challenge Grant at the Walters Art Museum in Baltimore by donating $500,000 to be matched by the museum, creating a $1 million dollar fund to purchase works of art by 18th-, 19th- and early 20th-century African American artists.